The Krugerrand was the first gold coin to contain precisely one ounce of fine gold, and was intended to provide a vehicle for the private ownership of gold. The 1 oz Krugerrand is one of the most iconic of all the gold bullion coin’s on the global market. First released in 1967, it is still the most traded gold bullion coin in the world. In 1980 the coin made up more than 90% of all gold bullion, although its market share has fallen since the introduction of many other government minted bullion coins around this time, which include the Canadian Maple Leaf, American Eagle and Britannia. The 1 oz Krugerrand has a diameter of 32.77mm and a thickness of 2.84mm. It has a reeded edge and its gold content measures 31.103g. The coin’s purity measures 22 carats (91.67%) which makes it highly valuable, far beyond its designated face value of 10 Rands. The coin’s design shows the national symbol of the Springbok on its reverse, the latest design of which was produced in 1984 by Coert Steynberg. 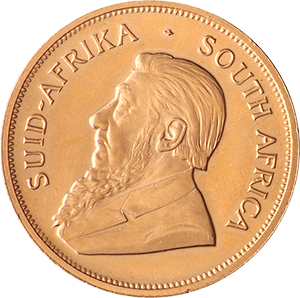 On the coin’s obverse is the portrait of former Prime Minister Paul Krugerrand, of whom the coin is named after. 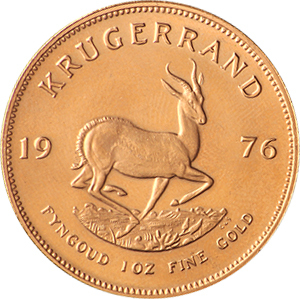 The remaining 8.33% of the coin that is not gold is made from copper or “Crowned gold”, which gives all Krugerrands their darker orange colour. Coins minted with silver alloys, instead, have a lighter colour. Copper alloys are known to be hardier and more durable, however, and therefore are more likely to maintain their value. In 2017, for the Krugerrands 50th birthday, special editions of gold, silver and platinum were produced, although these were considered “Premium Uncirculated”. Unlike many gold bullion coins, the Krugerrand does not release many special edition versions, with the exception of “Proof Krugerrands”. These Proof versions are produced with collectors in mind and are therefore typically more valuable than those traded by investors. Proof Krugerrands have more serrations on the coin’s edge (220) than those traded purely for investment (160).